As the year draws to a close we wanted to get some new items out to the community. We have been working on some additional Missions features and decided to release some of the updates to you so you can take advantage of them over the holidays. 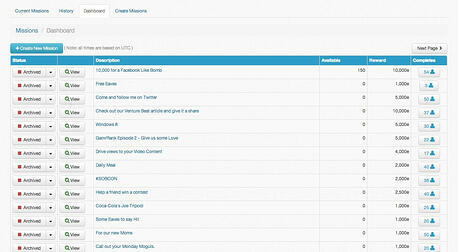 Today's releases are for the Mission creators, you now have a new My Dashboard to replace the old "My Missions" page. The new dashboard displays all your missions along with some additional data and controls all in one single location. We hope this will help you better manage and create your missions while giving us some flexibility for future changes. The new Dashboard also brings together some of the information to make it easier to see and interact with those users who complete your missions. Give us feedback and let us know how you feel about the new Missions Dashboard and what more you would like to see here!